to the Vesle and committed wholly to the defensive. The force of American arms had been brought to bear in time to enable the last offensive of the enemy to be crushed. 17. The First and Third Corps now held a continuous front of 11 kilometers along the Vesle. 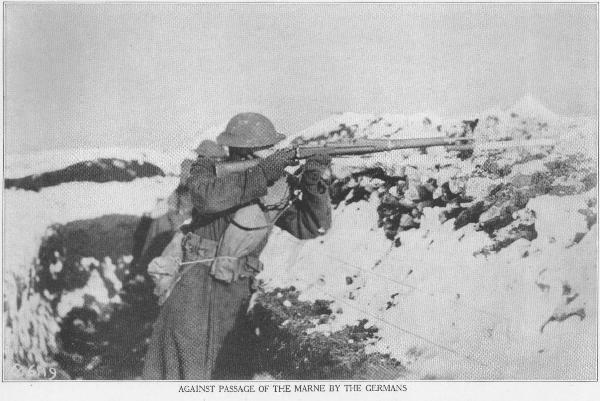 On August 12 the Seventy-seventh Division relieved the Fourth Division on the First Corps front, and the following day the Twenty-eighth relieved the Thirty-second Division in the Third Corps, while from August 6 to August 10 the Sixth Infantry Brigade of the Third Division held a sector on the river line. The transfer of the First Corps to the Woevre was ordered at this time, and the control of its front was turned over to the Third Corps. On August 18 Gen. Petain began an offensive between Rheims and the Oise. Our Third Corps participated in this operation, crossing the Vesle on September 4 with the Twenty-eighth and Seventy-seventh Divisions and overcoming stubborn opposition on the plateau south of the Aisne, which was reached by the Seventy-seventh on September 6. The Twenty-eighth was withdrawn from the line on September 7. Two days later the Third Corps was transferred to the region of Verdun, the Seventy-seventh Division remaining in line on the Aisne River until September 17. The Thirty-second Division. upon its relief from the battle on the Vesle, joined a French corps north of Soissons and attacked from August 29 to 31, capturing Juvigny after some particularly desperate fighting and reaching the Chauny-Soissons road. 18. 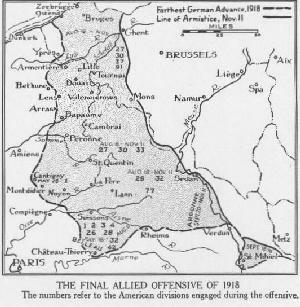 On the British front two regiments of the Thirty-third Division participated in an attack on Hamel July 4, and again on August 9 as an incident of the allied offensive against the Amiens salient. One of these regiments took Gressaire Wood and Chipilly Ridge, capturing 700 prisoners and considerable materiel.